City of Manila Mayor Lito Atienza, FNF Communications Officer Angelico Mercader and Democrat Party of Thailand Representative Klampaiboon applauds the launch. As the first major political party in the Philippines, the Liberal Party officially launched its own website. The new home of the Philippine Liberal Party on the Net is www.liberalparty.ph. 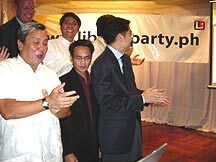 The momentous event – in terms of party history and online-politics in the country – was celebrated at an official launching ceremony on Thursday, April 10th, 2003 in Makati City. “As liberalism is about the freedom of information, the exchange of ideas and constructive debate, it is but natural for a political party adhering to the precepts of liberal democracy to build a home in the digital expanse of the Net”, writes LP president Congressman Butch Abad in his welcoming message. The launch was attended by nearly 200 members and friends of the party, among them the Mayor of Manila and LP Executive Vice President Lito Atienza. The Friedrich Naumann Foundation has supported the development of the website indirectly by providing technical advice and training courses for the LP’s media-team.